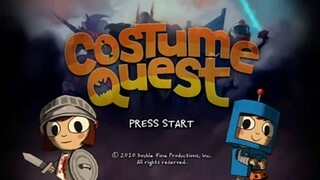 Released in 2010, Costume Quest sees the hero's sibling being kidnapped by a monster who mistook the sibling for candy, although clearly children are already candy for witches so it isn't that crazy of a plotline. The game also features candy as a form of currency which clearly promotes diabetes, and may or may not be sponsored by dentists. On a related note, I'll go grab some cookies. Best time: Single-segment 1:17:17 by 'Fullmetalgambit' on 2014-05-09.